We are pleased to present a new series of the Chinese LED flashlights and torches from the ROFIS Company in our online store! With the adoption of unique technical solutions, it strives to meet different illuminating demand from the customers, so as to offer more cheerful product experience for customers. Its main products including JR series, TR series and ER series. It has been continuously increasing its product series and strengthening its innovation consciousness. 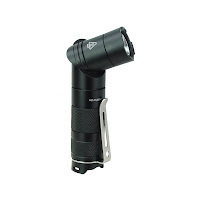 Assortment of the ROFIS flashlights includes the Tactical Flashlights, Transformable Flashlights and compact pocket flashlights. Made of either aircraft-grade aluminum (JR series) or polished stainless steel (ER series), these little flashlights are extremely durable. Rofis flashlights use long-lasting LEDs, fit in the palm of your hand, are water-resistant to 2 meters and feature multiple lighting modes so you can choose between maximum illumination and extended runtime. ROFIS is a new manufacturer on the scene, with an innovative rotating head design for their first series of lights – the Jazz "Transformers". For example the 1xCR123A JR10 and 2xCR123A/1x18650 JR20 models. You can run them as straight-through flashlights, or angle the heads up to 90 degrees.